The design comes from New Zealand and the long, raking bow gives more than a hint of the origin. Layout is closed hardtop and, in its homeland, would have had a rear bulkhead to form a wheelhouse. In our happier climate it has shed this and gained opening side glass and skylights. The hull structure features a perimeter chamber with eight individual compartments which, coupled with the underdeck chamber, give virtually a double hull. And, naturally, level flotation. Deadrise is a sharp 24 degrees but, unlike the current trend in deep-V boats, does not have a flooding keel to balance it. Instead there is a small permanent glycol-water ballast tank plus a long, narrow 370 litre fuel tank carried low. Between them they do a very good job. Stability is given an extra hand by the low, below waterline, deck, which also means a more secure feeling for those standing at the rail. The helm position is a driver’s delight, starting with excellent suspension seats and well placed grab handles for when standing. The controls and monitors are logically laid out – something that has been getting widespread attention in recent times – and nothing is a stretch, including the radio mounted overhead. Carried just below eye level is a pair of screens; two because this is a serious fishing boat and serious anglers do not want to flick between fish finding and navigating functions. The dedicated sounder is a top shelf 1kW Furuno, the plotter a Simrad. For tricky reef country the skylights are well located for the driver to stand on the seat and insert his head for a higher view. The deck is sheathed with Comcork, a near indestructible non skid material – the kind needed to take a long lifetime of coping with cray pots. These are pulled via a derrick-style hauler with the winch mounted on the derrick mast. Other styles of fishing are thoroughly catered for. Tackle boxes hinge down, there are rod sockets galore, bait board, an enormous live bait tank with a slide-out esky below it, deck wash, and room to move. A neat space saving touch is a pair of seats that fold up flush into the boats’ sides. More seats mounted on eskies are sited aft of the driver and navigator. The cabin is purposely short, being intended for shelter, storage and an optional toilet. An Engel fridge lives under one of the settees; in keeping with the thoroughness of the rest of the boat’s fit out this gets its own power supply panel and fuse. The cabin has a rear bulkhead with a fabric door to suit the toilet function. 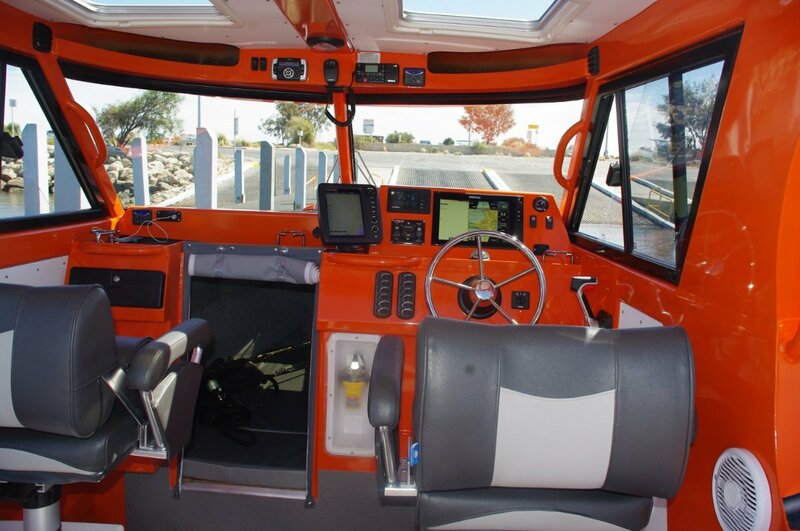 The short foredeck is equipped with rails fitted more for people in the water handling the boat at a jettyless ramp than on-board grab rails. Logical, and it makes for a neater looking boat. Right up front a drum style windlass handles anchoring. Under way the 6.5 is the real deal. 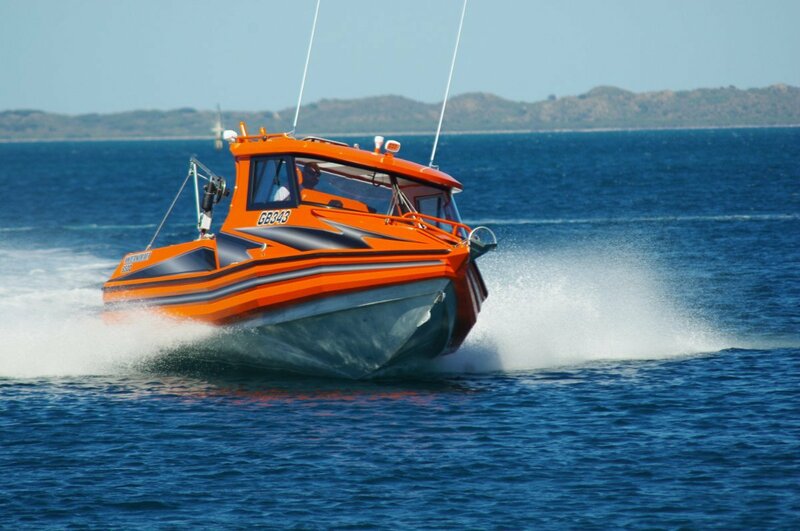 Kiwis design boats to cope with breakers over harbour bars – which just about sums up every launching place the country has. The boats laugh at pretty much everything else they meet. The ride in this one is very good to excellent. You would expect it to be when sitting in a suspension seat, but it stays that way when you move into the Spartan side seats. The hull naturally trims well; the smallest adjustments of power trim perfecting it. The trailer was built by the hull builder. This is part of a trend that probably reflects the boat builder’s wish to control the whole of the buyer’s experience. Retrieving was as simple as it could be: a single handed drive-on finalised by the auto catch and release mechanism. An effortless day.